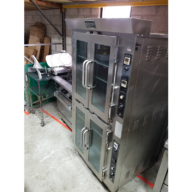 VG40 - USED VULCAN 40 GALLON GAS TILT SKILLET INCLUDES FREE SHIPPING - Delray Food Service Equipment & Reconditioning Inc. Stainless steel front, back, sides and 12″ legs with adjustable flanged feet. Front hinged polished stainless steel pan body with covered interior corners and embossed gallon markings. Stainless steel cooking surface bonded to steel plate. Full width 4″ return flange with formed pouring lip. Stainless steel spring assist cover with wrap around cool to the touch handle and condensate lip. 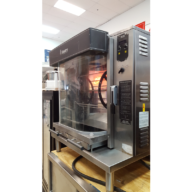 Lid stops in place for vented cooking. Drop away food receiving pan support mounted under pouring lip. Manually operated anti-jam pan tilting mechanism with removable handle. Pan can be fully tilted to empty completely with approximately 30 crank revolutions. One 30,000 BTU/hr. burner for each 12″ pan width. Burners shut off when pan is tilted 5°. Electronic ignition system for automatic burner lighting. Solid state temperature controls, adjustable from 50°F to 425°F.